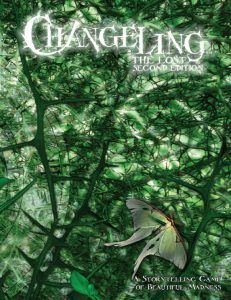 This excerpt comes Changeling: The Lost 2nd Edition. Part I was posted previously here. It always starts the same way. Everyone already fleeing the burning building, lightning striking over and over, driving out the darkness in the night sky. Sometimes I’m standing amid the fleeing people, counting them as they turn to monsters before my eyes. Sometimes I’m running with them, my limbs stretching out in front of me, my hands disappearing into mist. The words of my scream catching in my throat and dissolving into a toneless sigh. Sometimes I’m on the roof, directing a man hurling lightning bolts, showing him who to strike next. I’m dreaming it a couple of times a night now. Cycling through the possibilities, faster and faster. When I was little, I knew that I saw things in my head. That I remembered them before they happened. People getting hurt. People dying. Once, I tried to warn my aunt that her cat was going to be hit by a car, but she just blamed me when it happened. I didn’t tell anyone after that, but the seeing never stopped. I tried to ignore the memories when I had them, and more often than not they were so disorienting that it was easy to just call them dreams. This doesn’t feel like a dream anymore, and it’s never come on so strong. Never carried so far into waking. I can smell the rain already. Petrichor wafting up from dry concrete. Cold droplets on my skin under a clear sky. I feel like I’m being asked to pick a side, but I don’t know which is which, only that not picking is just as dangerous. Something bad is going to happen, and if I’m not careful, it might be my fault. And I don’t think I have much more time. I have to tell someone soon. So I went to a coffee shop. Don’t laugh. I couldn’t think of anyone I knew who would believe me. A stranger seemed almost more likely to take me seriously. So I sat outside, in a chair that was going to be washed away, watching rain fall into my cup, waiting for the rumble that meant it was finally too late. The tide pools just across the street were almost dry. The water all drawn back to the bay and the sea, exposing the barnacles and tiny plants that burrow into the rocks. The cold sea water that will rush over this rocky ledge won’t dislodge them, but the wrecked wood that it carries back will. Her hair is a short black spray, and I know she’s going to live, so she seems like a good choice. I recognized her frightened face from futures where I ran or sometimes stood alongside her. Wendy. Wendy who ran. Just once, she and I ran. Pulling along two children that wail to go back. The littlest flies out of my arms, struck by the same bolt that hits me. Not that path, hopefully. Her children and I would die together. She flinched when I told her about the dreams. About the tide coming in. About the apartment building. About the monsters. “They’re not monsters.” She almost hissed. And as she shook, feathers fell from her hair. “They’re just people. Just kids.” She wanted to go back right that moment. To get her children. To sound an alarm. To do something. I told her about the sea. I told her about the man with electricity in his heart, whose skin was too tight for his bones. The hungry shadows he pushed us toward, with their silver nets sifting us off the ground like pearls in sand. Once I opened my mouth, I couldn’t close it. I told her about everything. Even the cat. She listened to me quietly, asking gentle journalist questions as the wind hissed and the rain started pricking our skin. Looking for facts, some seed buried in my memory than we could start from. Then she told me about her children. About her new home. About being surprised by love. And about what we needed to do. Because it was too late to run now, we had to fight or burn. Or that’s what she said, at least. I felt wrung dry. Like I had nothing left inside me now that I had delivered this message to her. But she dragged me along, and I wasn’t in any position to argue with her. If I didn’t come along, she wouldn’t succeed, and it would be my fault. If I did, it still might, but it would at least have been a choice. The rain finally felt as strong on the outside of my skin as it did on the inside. I said goodbye to the chair. And then she took me home. I watched our reflections in the windows. Each failure splashed across our faces, bathed in firelight. How to thread the needle? Confront the man with wrath in his hands, and everyone dies faster. No survivors, neither red hind nor spring hare doe. Let him alone, and many flee, but none are saved. She had a plan, but it wouldn’t stay under my skin. All I could see were the mistakes we might make. What will happen if I don’t convince him. If she can’t empty the lobby. If a black-haired woman can’t lead the right people to the right roof. If there are three children instead of five. If the blonde in the pink skirt doesn’t accept an invitation or trust a strange hand. So many ways for it all to go wrong. But after that it stops — mid-gesture, mid-thought. The streetlights finally died, and we drove the last mile in darkness, by hope and by memory, amid strange growls and the suggestion of hands against our windows. The parking lot was flooded with people and the sea. Murky water rushed up out of storm drains, full of small gray fish that gathered where our feet fell, dragging our steps back out toward the blackness beyond. She passed through the lobby lights, cast onto the puddles below our feet. When she opened the door, I trailed after her like a little gray fish. Inside, the scene had already begun. Three of Wendy’s kids were already quietly ushering people out — two teenagers and a baby, waifish and covered in silvery feathers. A man with no eyes, who looked like he’d been crying. Two ghostly children trailing after a woman with short purple hair and a cow’s tail peeking out below her skirt. But two children were missing. The blonde and black-haired women were close enough to kiss, all three whispering when they wanted to be shouting. But their arms were pulled tight and angry against their bodies. Lightning stood among them, skin too tight for his bones, crackling around the edges of my vision. And I was blind. ◀ Episode 37: A Harrowing Deep Dive into (Wraith: The) Oblivion!